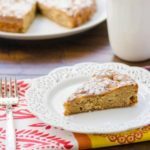 A recipe for pear almond cake made with fresh pears, sliced almonds, and sweetened with brown sugar. It is a single layer cake garnished with a dusting of confectioners sugar. Preheat oven to 350 degrees F. Grease and flour two 8-inch round cake pans. Note: you can also line the bottom of the pans with parchment paper for easier release. Whisk together flour, cinnamon, salt, baking powder, baking soda, and nutmeg in a medium bowl. Cream butter and brown sugar in a large bowl using a hand mixer on high speed. Stir in pears and almonds. Divide and spread batter evenly into prepared cake pans. Bake 35 to 40 minutes or until a toothpick or cake tester inserted in the center comes out clean. Cool cakes in the pans for 10 minutes. Turn out cakes onto wire racks and cool completely. Dust tops of cakes with confectioners sugar. For a lace design, place a paper doily on each cake before dusting. Carefully remove doily after dusting. Cakes can be wrapped in freezer wrap or foil and frozen for up to 2 months. Thaw at room temperature. Dust with confectioners sugar before serving.